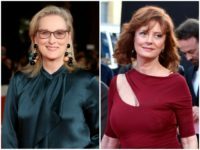 A pair of Hollywood stars went at each other’s throats over politics as TV actress and Twitter warrior Debra Messing criticized film star Susan Sarandon for crediting Donald Trump with inspiring more women and minorities to run for office. 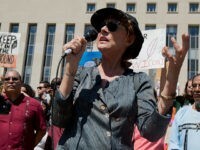 Actress Susan Sarandon was arrested in Washington D.C. on Thursday during a mass protest against the Trump administration’s illegal immigration and border enforcement. 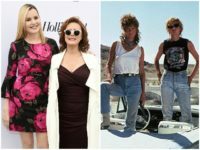 Producers say Geena Davis and Susan Sarandon will take the stage together at Sunday’s ceremony. 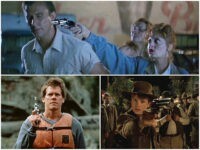 The actresses played the title roles in the 1991 film. Susan Sarandon opened up about her sexual orientation in an interview with pridesource.com and admitted that she might be attracted to both men and women. 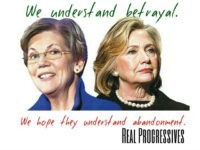 Susan Sarandon formally endorsed Green Party presidential candidate Jill Stein in a letter Wednesday that also lists several reasons why the actress cannot support Democrat Hillary Clinton. 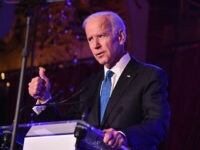 Actresses and staunch Bernie Sanders supporters Rosario Dawson and Shailene Woodley aren’t necessarily prepared to vote for Democratic presidential nominee Hillary Clinton, even after the Vermont senator endorsed her and called for unity at the party’s national convention earlier this week. Hey, America. 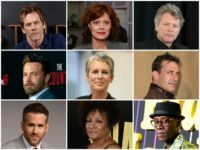 Lots of rich, famous Hollywood celebrities love Hillary Clinton. And so you should love her, too. Actress Susan Sarandon joined more than one hundred Black Lives Matter activists for a Saturday protest march through Brooklyn. 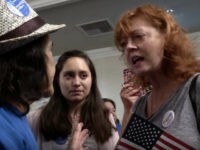 WATCH: Susan Sarandon Yells at Hillary Clinton Supporters: ‘Were You For’ The Iraq War? 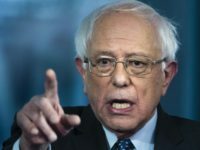 Actress and staunch Bernie Sanders supporter Susan Sarandon was caught on video in February engaging in an intense shouting match with several Hillary Clinton supporters, as she tried to convince them that the presumptive Democrat presidential nominee’s positions on the Iraq War and on fracking precluded her from being a viable candidate. 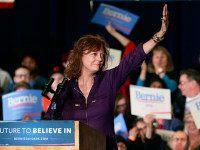 Actress Susan Sarandon, an avid supporter of Bernie Sanders’ presidential bid, blasted Sen. Elizabeth Warren (D-MA) on Twitter Friday for her recent endorsement of Hillary Clinton in the presidential election.